So... two days after my return visit to Tenku RyuGin (天空龍吟), I arrived at Ta Vie 旅 to sample the new dishes that Chef Sato Hideaki (佐藤秀明) wanted to show me. The small gang of us all used to work together, and it's been way too long since we sat at the same table. Tonight we would (belatedly) toast ILove Lubutin's birthday. Baby cuttlefish with ratatouille, potato and fennel cream - served on a beautiful glass dish, the 新甲烏賊 from Nagasaki (長崎県) has a nice texture which retains just the right amount of crunchiness and bite while still soft. The cuttlefish itself wasn't really seasoned so one could taste the original flavors, but combining it with the ratatouille or the potato and fennel cream was also nice. Sweet corn puffed mousse with "aburi" lightly torched botan shrimp in shrimp broth jelly - Sato-san's current signature dish, which he chose to send us as an extra. I doubt I would ever get tired of having this... since the corn mousse was so incredibly light, airy, and almost ethereal. The raw chunks of botan shrimp (牡丹海老) were nice, but the shrimp broth jelly was the real killer... Slurp. Consommé of "Lung Guang" chicken with grilled matsutake mushroom, chicken wanton - I know Sato-san and his mentor Yamamoto Seiji (山本征治) really like the Lung Kong chicken (龍崗雞) of Guangdong, so it's not surprising that this was on the menu. But it was a surprise that we didn't get the deliciously grilled chicken... and got chicken wontons instead. The chicken consommé was simply divine, helped in no small part by the presence of matsutake mushrooms (松茸). The minced chicken leg inside the wontons were seasoned with a surprising amount of black pepper, but still pretty tasty. "Civet" braised abalone with chestnuts, served with house made spaetzle - the chunks of abalone were nice, and flavored with abalone and chestnut sauce that was also a little peppery. Unfortunately the spaetzle was a total mess... just way too soft and mushy. Turnip, crab meat and house made fresh cheese salad, scent of yuzu - love the look of these paper-thin wafers of turnip. Underneath the canopy of turnip, we find fresh homemade cheese as well as shredded snow crab (楚蟹) meat, along with thin slices of apple. The crab was very, very tasty. And there's the homemade nukazuke (糠漬け) bread, which I inhaled very quickly along with my half pat of butter. Lobster poached in bell pepper oil with bell pepper aioli - I could taste a little bell pepper flavor in the lobster, but the dish really needed the aioli to come together. The acidity in the aioli was a little stronger than expected, but that wasn't necessarily a bad thing. Bouillabaisse - served on the side, and I found it really nice and sweet. It certainly didn't have as much umami from the shells and heads as what David Lai would make, as this was a lot sweeter, but this was also more refined with some straining. Yum. Braised beef tongue red wine reduction sauce, butter milk potato purée - I was surprised to see beef tongue on the menu, and it certainly looked luscious covered in the red wine reduction. But here's the problem... Many of us - myself included - love beef tongue for its texture... and expect a certain amount of springy, bouncy bite on the teeth. When you braise the tongue, you break down the muscle fibers and it becomes soft like braised oxtail or shin... which are delicious in their own right, but not exactly what I want out of a piece of tongue. Lemongrass ginger tea - loved having this palate cleanser again. Japanese golden peach with osmanthus flower sabayon sauce - peach compote at the bottom, with vanilla ice cream, and sabayon made with orange and peach juice. Wonderful dessert, especially the shredded orange rind inside. Matcha tiramisu - loved the matcha (抹茶) flavor, but didn't care for the texture of the sponge cake since it was too hard. I guess when the word "tiramisu" is there, I kinda expect soft, fluffy texture from soaking ladyfingers in coffee and liqueur. Mint and pandan tea - I just love having this tea... soooooo fragrant! The petit four tonight was cape gooseberry ice cream, which was interesting and nice. 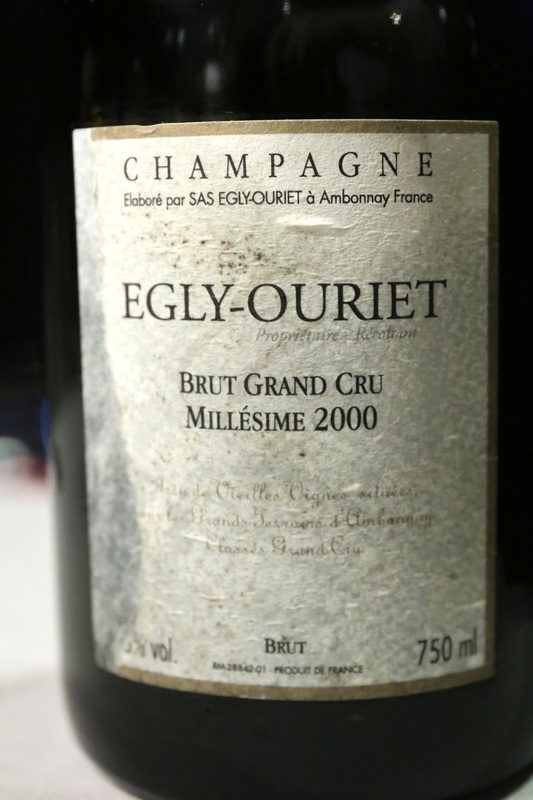 2000 Egly-Ouriet Brut Grand Cru, dégorgée Mai 2008 - nice and yeasty with medium toast, a little sweet grass. Very fragrant with that caramelized nose I love so much. Nice and ripe on the palate with good acidity, and a little orange marmalade. So delicious. 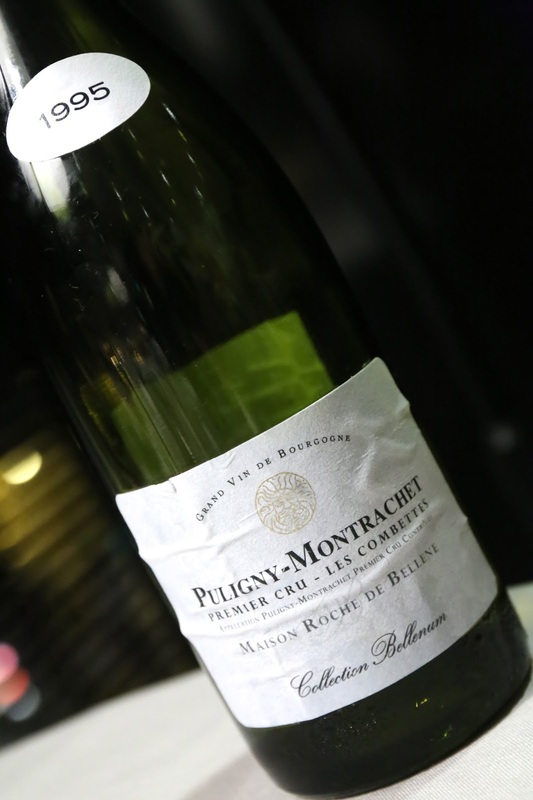 1995 Roche de Bellene Puligny-Montrachet 1er Cru Les Combettes - pretty ripe and oxidized, with orange blossom, pollen notes. Slightly butter when opened up a little more. Finish was a little bitter. 1997 Remoissenet Montrachet - refreshing lemon citrus, a little more toasty here... almost more like a Meursault with the bigger toasty nose. Later the ripe and buttery notes showed up as the wine opened more, and the wine fluctuated between the buttery side and the toasty side. Seems to be an incredible place ! I hope I get the chance to eat there one day. I had met Chef Sato at Omnivore Paris and he was brilliant and adorable. When I read your article, I feel that his cuisine looks like that of Chef Mitsuru Konishi at Takumi Wagyu. This type of cuisine midway between France and Japan is increasingly common especially in Paris but only few Chefs create a real identity. This is a privelege to have this type of restaurants in Hong Kong. There will be a 4-hands dinner at Ta Vie with Chef Sato Shinichi of Passage 53 in early December... FYI.